Relationships do not really end – they only become redefined. And no matter what experiences we have, they all afford us opportunities for growth and great Self-realization. Through the myriad forms of relationships we experience over the course of a lifetime, we have the opportunity to learn about ourselves—to see how each relationship, no matter how challenging or difficult or joyful, causes us to change, to grow, and even to discover unknown inner strengths. In Closure and the Law of Relationship: Endings as New Beginnings, lifestyle and relationship expert Lissa Coffey show us how the Law of Relationship works to our benefit to help us improve our lives. – “The universe teaches us that relationships don’t end,” Coffey says. “We remain connected to the people in our lives through our memories and shared experiences. Coming to terms with the changes in our relationships is what will bring us closure.” With real-life examples, Transformation Applications, and Wisdom Affirmations throughout, Coffey has created a practical, spiritual guide that offers a five-step process to help us achieve a sought-for peace of mind and greater Self-realization. Lissa is so right about her perspective to relationships. Each person with whom we bond has come into our life for a purpose. They are either a teacher to us or we are a teacher to them. When we focus on the lessons that person’s interactions have taught us, then the transition of the relationship, including the ending of it, has great insight for us. All relationships are temporary, so when we embrace that closure is a transition it is easier to move through. In this inspiring and practical book, Coffey takes us on a journey of human relationships, interweaving real-life examples as she speaks about the ties we create with our parents, partners, siblings, children, and coworkers. Coffey says the Law of Relationship is a tool we can use much in the same way as we use the Law of Attraction. It explains our universal interconnectedness and puts forth the point that we are here to help each other on our path of progressive evolution. Coffey shows how relationships are built, how they change, what we can do when this change occurs, and how profoundly we can be affected when the relationship is over. She explains how, when a relationship has run its course, we may be left with unanswered questions and painful feelings, such as anger, guilt, or grief, which continue to negatively impact our state of being. To move on, to progress, a sense of closure becomes of paramount importance. In this, her newest book, Coffey provides a five-step process through which closure becomes possible. With the assistance of real-life examples, Transformation Applications, and Wisdom Affirmations, Coffey illuminates our understanding and provides activities to help readers process the different relationship stages. In Closure and the Law of Relationship, she has created a practical, spiritual guide to help readers achieve peace of mind and greater Self-realization. Get the latest Closure products! Eastern philosophy teaches us that change is inevitable, and yet suffering is not. In her insightful new book, Closure, Lissa Coffey shows us how to learn and grow as we move through the evolution of our relationships. 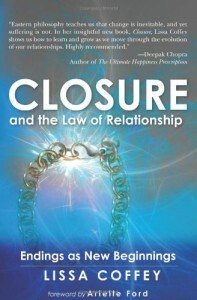 Closure is the essential guide for anyone who is looking to increase their sense of peace, joy and fulfillment. 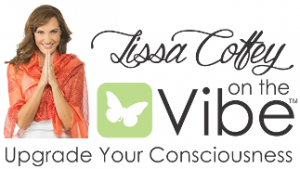 Follow Lissa¹s wisdom and experience a total sense of enlightenment. What is, is; your relationship is over. Now Lissa guides you through the difficult process of accepting the things you cannot change, minimizing the pain, and moving on. You’ll feel better, and you’ll grow as you learn. I will be giving this book to many of my hypnotherapy clients. I loved it! As so often is the case, books that are supposed to lead us back to ourselves can be dense and complicated. Lissa’s book allows the reader to understand the insight and wisdom it takes to come back to the joy. Her words reflect how much she truly cares about the healing of humanity. Brava! Who among us hasn’t been devastated by the loss of a relationship‹whether through separation, divorce, or death? Most of the time, we can’t see beyond the present moment and mistakenly believe that life could never be as good without that other person in our daily lives. By the end of the journey through Lissa Coffey’s book, Closure, we come to realize that we will be better for having loved, and life will be even sweeter when we start to live it again! There can be no doubt that Lissa Coffey knows from whence she speaks when it comes to relationships. She understands that every relationship, regardless of how good or bad it is, shall have an ending as surely as it had a beginning. Lissa shows us how to open the portal of closure and gently guides us through the opening. The result is nothing less than the peace that passes all understanding. Lissa demonstrates how closure allows us to step into the present moment where new life awaits us with open arms. That is the blessing to be found in this book. Take the STRESS QUIZ to find out! Like the Closure Book on Facebook! "It is a great piece of skill to know how to guide your luck even while waiting for it." Go ahead and carry that four-leaf clover, or pick up that lucky penny- it couldn't hurt! But meanwhile, we need to take the necessary steps to create our own opportunities. By being opening to what presents itself, we become lucky - we recognize when the universe is working to help us realize our goals, and we go along with that plan.